My 4 year old likes to play fetch with the dog in the living room. Unfortunately his throwing skills are not very accurate yet. The dog is constantly trying to figure out how to get behind the TV or climb up the book shelf. It’s much easier outside when I can put him in the center of the yard away from all dog obstacles. I’m reminded of the time my mother threw a rope toy for the golden retriever we used to have. He chased it down the stairs, tried to stop on the laminate flooring, and slid half way across the living room into the very large, very expensive hand made porcelain doll mom had sitting there. Dog, doll, and rope all survived without injury. 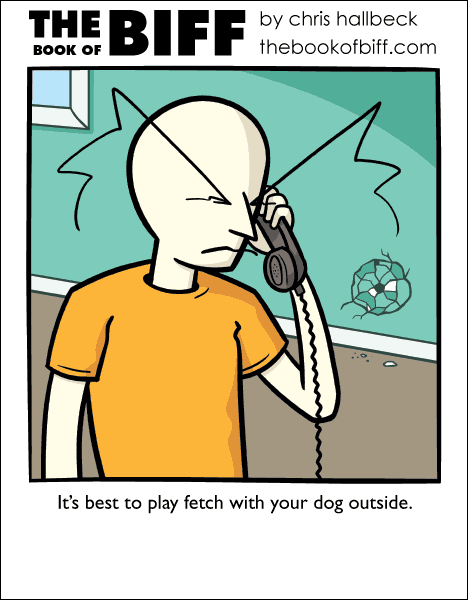 We always play fetch with the dog indoors. He’s not that big, and he doesn’t want to run that far just to pick up a toy that I threw to him. We have tried to play fetch outdoors, but he won’t get the ball for us. He’ll just walk up to it and sit next to it, to show us where it is. The last times we tried playing fetch outdoors (over a year ago), he would only show us where the ball landed *once*, and then he would lose interest in finding the ball. Playing fetch is apparently waaay much more fun when you’re indoors, and the toy is something else than a tennis ball. At least do it with a Pug, so nobody else gets wise right off. I just have to ask, is he calling a vet, or a contractor?